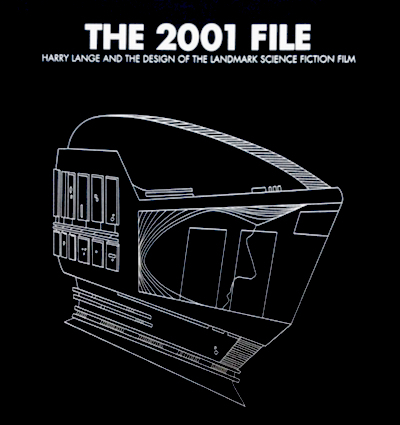 The 2001 File: Harry Lange & The Design Of The Landmark Science Fiction Film features material from the archives of Harry Lange, who was one of the production designers of Stanley Kubrick's 2001: A Space Odyssey. The book is by Christopher Frayling, who has also written two previous books about another Kubrick production designer, Ken Adam: Ken Adam Designs The Movies and Ken Adam & The Art Of Production Design. The book begins with a lengthy account of 2001's pre-production, quoting from Kubrick's correspondence and script drafts. Kubrick initially approached Adam to work as production designer on 2001, though Adam wavered and Kubrick replied: "I can appreciate how ambivalent your feelings may be towards my mystery film... I would suggest, therefore, that we drop all further discussions about it and I will seek divine guidance elsewhere." Kubrick then contacted matte artist Chesley Bonestell, explaining that he was working on "a science-fiction film, which might prove to be the definitive attempt." Lange was ultimately hired as production designer, and the book includes photographs of memos from Kubrick to him. The Lange archive is The 2001 File's main focus, and 250 pages are devoted to reproductions of his designs: blueprints for various spaceships, sketches of spacesuits, and drawings of equipment. It's therefore a companion to Adam K Johnson's 2001: The Lost Science, which includes similar designs by 2001's scientific advisor, Fred Ordway. This is the latest of many books devoted to 2001. Others include The Making Of Kubrick's 2001 (by Jerome Agel), The Making Of 2001: A Space Odyssey (by Stephanie Schwam), 2001 Memories (by Gary Lockwood), Moonwatcher's Memoir (by Dan Richter), Are We Alone? (by Anthony Frewin), 2001: A Space Odyssey (by Peter Kramer), 2001: Filming The Future (by Piers Bizony), and The Making Of Stanley Kubrick's 2001: A Space Odyssey (also by Bizony). Frayling is also the author of Once Upon A Time In Italy, Something To Do With Death, and Spaghetti Westerns. He contributed to 1,000 Films To Change Your Life and Gothic; he has recorded commentaries for the DVDs of James Whale's Frankenstein, Sergio Leone's The Colossus Of Rhodes, and Leone's 'man with no name' trilogy.